I’ll be honest, I bought into most of the physical collectible games in the past. I enjoyed picking up Skylander and Infinity figures for cheap, and building the Lego Dimension sets were mindless fun. However, Ubisoft has shown the best way to handle a game with physical figures on consoles: offer digital editions. Sure, you could rent characters in Dimensions, but being able to own the full version digitally with no strings attached is great. 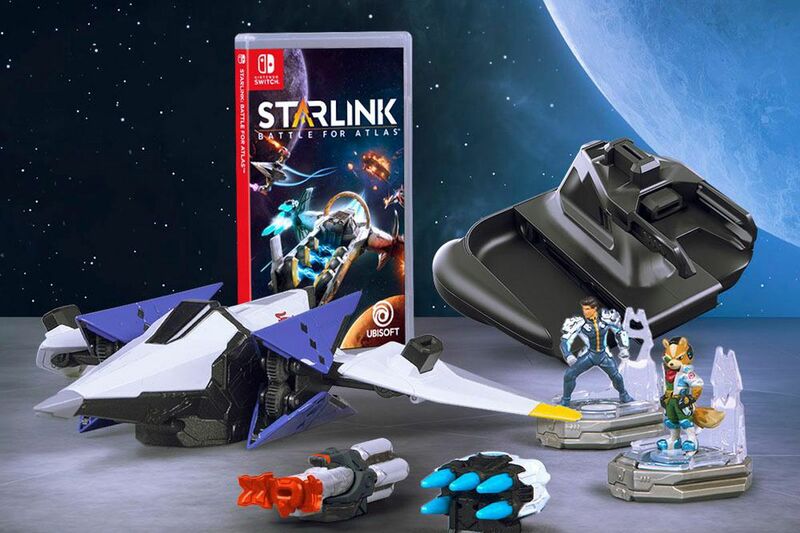 Starlink: Battle for Atlas is Ubisoft’s first try at physical collectible games. I’m going to talk about the digital edition for most of the game, but I should make a note about the physical edition. The ships the team created look great. They aren’t cheap plastic and actually have some heft to them. For kids, they’ll be a blast to play with outside of the game … just don’t lose those weapons. Changing the ships out does take a bit of time to unhook and rehook a new one into the controller deck. It also takes a minute to switch weapons on ships. However, if you just have the physical edition and plan to play in the handheld mode, the game will put a digital edition in the game that can be used for seven days before the ship has to be docked again. However, the digital version gives you permanent access to a few ships, pilots and weapons to switch in and out. Plus, the Digital Deluxe edition unlocks all ships, pilots and weapons, giving you an early boost and making sure key items needed for puzzles later on are already ready to be used. Plus, with these ships basically acting as lives (unless you want to pay quite a few coins to revive ships), it’s better to have access to as many as you can. Getting to the game itself, players will be able to take their pilot, ship and two weapons in to the planets in the Atlas system to take on Grax and the Forgotten Legion. While on each planet, you’ll be able to battle the hives, construct facilities, scan the local plants and animals and take on a Prime boss at the end to finally free a planet from captivity. While you can just rush the main story to get to each Prime, by building facilities, you can get more armories and more ships to aide you in battle. The ships can also take out extractors, making the Prime weaker and having less phases to fight through. By fully completing a planet before the Prime, a final better can go from 10-20 minutes to only a few. Additionally, taking down Primes can weaken the Dreadnought ships in space, also making those easier. Ubisoft Toronto made sure to make as many activities as possible matter, thus making sure you’re more likely to spend more time on each planet and in their universe. Thankfully, all combat is really smooth. Switching weapons takes only a few seconds, and controls are fluid as you skim across the surface or fly in the skies. Weapons have a pretty quick cooldown timer, but even when it does overheat it’s easy to jump and dodge enemy fire. Overall, Ubisoft Toronto did a great job in designing amazing worlds to explore, even if there’s not a huge amount to do on each. Outside of the different quests mentioned above, there’s not much to do except to see what each world looks like. Sure, you could scan all the flora and fauna, but it really doesn’t do anything for the overall story. Starlink: Battle for Atlas is a great ship fighter that's easy to pick up and go. While the collectibles do look nice, the digital edition can give you everything you really need. Starlink is a strong blend of space fighting, planet exploring and family-friendly gameplay that will be great for the holiday season.